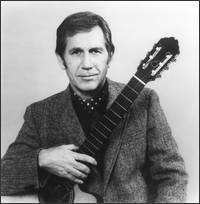 Following the huge success of "Stay Tuned" this album continued the R&B/jazz dimension for Chet Atkins. Chet's unique version of "Classical Gas" is included. Co-produced with Chet by Toto's original bassist David Hungate this album is considered one of Chet's most beautiful ever. He is joined on this album once again by Mark Knopfler and Earl Klugh. Includes Knopfler's song "Why Worry, the haunting title track "Sails", and an original Chet tune "Wobegon (The Way It Used To Be) dedicated to Chet's new friend Garrison Keillor. This album was a Grammy winner for Chet and Mark. In the tradition of contemporary beauty found on "Sails" Chet performs, for the first time, his now-famous remembrance of his father "I Still Can't Say Good-bye", as well as John Lennon's "Imagine" and 8 other songs. Chet loves this album. He named it after himself! By far Chet's biggest selling album for Columbia Records, Chet and Dire Straits' "rock" guitarist Mark Knopfler team up to deliver a guitar-lover's dream album. This was another Grammy winner for Mark and Chet. You can listen to this album 10 times straight and never tire of it's great musicianship, musical beauty, and the obvious joy two great players had with each other. Chet's favorite reaction to this album was a fan's asking "Did you guys know the mike was on when you recorded that album?" A must-have album for Chet's fans, and fans of the guitar in general. Another duet album for Chet, this time with guitar original Jerry Reed. Over the years Chet has recorded over 30 tunes written for guitar by Jerry Reed. On this album you get to hear Reed's mastery of rhythmic melody on his famous "The Claw", plus "Summertime" recorded as only Chet and Jerry could play it, Reed's unique "Major Attempt at a Minor Thing" and 8 other gems. This album combines the contemporary music of many of Chet's Columbia albums with a return to his country roots by featuring country friends Steve Wariner and Suzy Bogguss as well as rock's own Eric Johnson. TNN did a 1 hour Chet Atkins special based on this album. Chet's famous version of "Vincent" is included here, as well as his Grammy winner "Young Thing". Some of Chet's diversity is well represented on this must-have album. 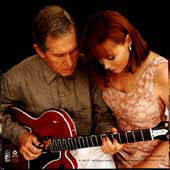 This newly recorded album features Chet Atkins as some like him best - almost alone. With many of the 11 tunes performed by Chet solo in his unique thumb-picking finger style Chet fans from around the world will love this reminder of the unique style that originally made Chet famous. Includes a live rendition of Chet singing his soon-to-be-a-classic "I Still Write Your Name In The Snow". Chords & melody, hot licks, tuning, changing chords, fingerpicking, more. On-screen clock, split-screen closeups, on-screen chord names. Basics & more. Hi-fi stereo.